These are hand selected and photographed commercial Grade B jackal skin rugs and jackal hides with head, feet and claws imported from South Africa, with natural imperfections. 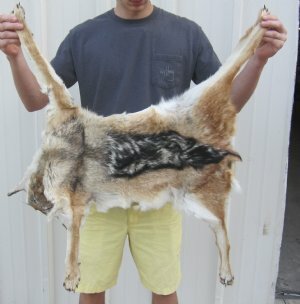 These full jackal skin rugs and jackal hides have an odor and need to be aired out. All our animal products are by-products of the African, culling program and farming industry. All products were professional cleaned and/or professionally tanned in South Africa and cleared by the U. S. Fish and Wildlife Services and U.S. Customs Services for legal entry into the United States. $100 minimum order required! - NO International Shipping! A signature will be required on all boxes having a value of $250 or over.